A recent study published in the December 2014 issue of Environmental Toxicology found that increased exposure to nanoparticles can potentially lead to elevated risk of cardiovascular diseases. As the consumption of nano-based products continues to rise at exponential rates, this research sheds light on the potential health hazards new technology can have on our bodies to ensure that we take these issues into consideration during nanotechnology development. What are Nanoparticles and Nanotechnology? Nanoparticles (NPs), sometimes referred to as ultrafine particles (UFP), are particles that range between 1 and 100 nanometers in size. According to the nanoscopic scale one nanometer equals about a billionth of a meter. Now that is small! They also range in shapes, sizes and materials, and can express different properties under different circumstances, making them key to the development of new technologies. Nanotechnology aka “nanotech” refers to the manipulation of these particles on the molecular level. These structures have such diverse applications and have taken on the interest of various fields including, but not limited to: science, medicine, and government. The applications run the gamet from self-cleaning products to quantum computing and medicine to solar energy. 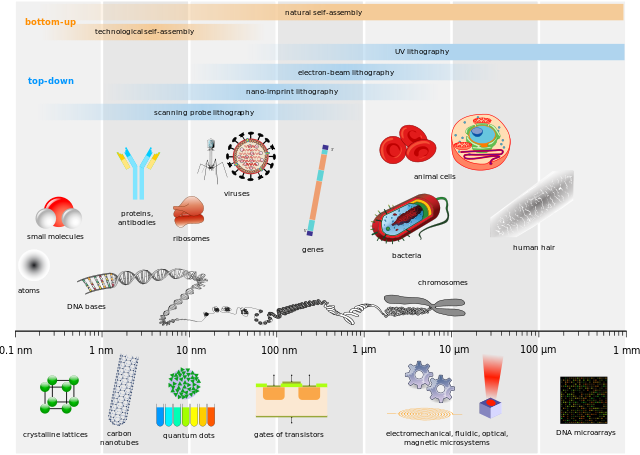 As nanotech continues its reign, it’s always important to take time and examine the potential environmental and health impacts of these emerging technologies. Studies have shown that nanoparticles may have adverse effects on the environment and now suggest that they can be detrimental to our health. A team of researchers from Technion Rappaport Faculty of Medicine, Rambam Medical Center, and the Center of Excellence in Exposure Science and Environmental Health (TCEEH) aimed to gain insights into the cardiovascular risks associated with nanoparticle exposure. For this study, they wanted to test the particular effects of NPs of silicon dioxide (SiO2) on our cardiovascular system. Using laboratory cultures of mice cells resembling arterial wall cells, the team of researchers exposed the cells to NPs of silicon dioxide and investigated the effects. They found that exposure to SiO2 induces an atherogenic effect on macrophages (type of white blood cell that takes up lipids), essentially promoting the formation of fatty plaque in the arteries. Overtime, this accumulation of plaque in the arterial walls can lead to heart attack or stroke. To better understand the significance of this study, it helps to fully understand what atherosclerosis is and the underlying biological processes that take place causing it to occur. According to the National Heart, Lung and Blood Institute atherosclerosis is a disease in which plaque builds up inside your arteries. This wall thickens due to the accumulation of white blood cells. One of the main initiators of atherosclerosis is the inflammatory process that takes place in the endothelial cells of the vessel wall in response to the retention of certain lipoproteins (LDL). This inflammatory response is triggered once LDLs leave the bloodstream and penetrate the vessel wall. Once they pass the wall these lipoproteins are more prone to the harmful process of oxidation. As a response, the endothelial cells attract monocyte white blood cells, causing them to leave the blood stream, penetrate into the arterial walls and transform into macrophages. Macrophages work by digesting foreign substances and cellular debris, and in this instance work to ingest the oxidized LDL particles. Unfortunately, this triggers a cascade of immune responses which over time can produce an atheroma if HDL removal of fats from the macrophages does not keep up. These special white blood cells (macrophages) absorb the oxidized LDL, forming specialized foam cells. If these foam cells are not able to process the oxidized LDL and remove the fats, they grow and eventually rupture, leaving behind cellular debris and other junk in the artery wall. This, in turn attracts more white blood cells, and repeats the whole process further inflaming the artery and increasing the presence of plaque. The body works to compensate for this additional bulk by expanding and increasing thickness of the endothelial lining. As the endothelial lining thickens it also stiffens and loses its flexibility to stretch with each heartbeat, eventually leading to heart attack and stroke. What Makes Nanoparticles So Dangerous? XNSPY Mobile Monitoring App, the Future of Digital Parenting?